There’s a reason comedy sketches are only so many minutes long. Once you’ve explored all possible permutations of a joke’s premise, there’s no real reason left to keep dragging it out. 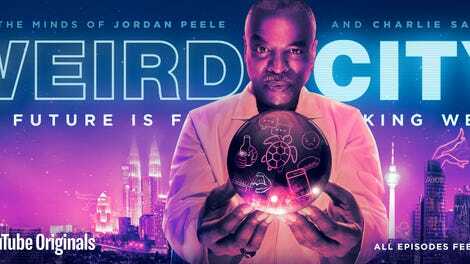 Weird City, the new sci-fi satire anthology series from Jordan Peele and his old Key & Peele writer-producer Charlie Sanders, knows it has to aim higher if it wants to be more than just a series of sketches expanded to half-hour episodes, but the methods it employs to do so are—to put it tactfully—weird. Here’s a show that tries to comment on contemporary life through a warped funhouse-mirror vision of the future, but lacks any real bite save for its sporadic attempts at comedy. Too broad to work as an Outer Limits-esque collection of fables, and not humorous enough to succeed as a joke delivery system, Weird City tries to go for gonzo, and ends up facedown in the mutant-worm-aerated dirt. In a not so distant future, in a city not unlike your own, society has divided itself in two. The Haves live above the line. This simple outline allows Peele and Sanders, credited writers for all six episodes, to have some initial fun poking holes in the current trajectory of technology and social media, from A.I. voice assistants to the ever-increasing glut of apps intended to make life easier by proliferating social obligations across an expanding web of digital arenas. But the good times quickly sputter out, as the framework of the advanced city is soon little more than an excuse for callbacks of references littered throughout the show, and any potential social critique to be gleaned from such a harsh cleavage of society is left on the cutting-room floor. But most disappointing of all, it’s shocking how little fun the series is. Showrunner Jose Molina clearly knows how to structure a story, but the materials he has to work with offer little in the way of incentive to keep watching. The first episode, after running through a few minutes’ worth of sketch-comedy inventiveness that could’ve served as a Key & Peele excerpt, turns into a weary story about a matchmaking service that inexplicably pairs The Maze Runner’s Dylan O’Brien and Modern Family’s Ed O’Neill together. The comedy is supposed to derive from the wacky idea of two straight white guys, decades apart in age, falling in love after all—a cringeworthy source of laughs. Played utterly straight, the “humor” lies in seeing people performing roles not traditionally expected of them; aside from a few bizarre and tonally out-of-place moments of absurdism, it’s basically an after-school special about an odd-couple romance defying social norms. If we’re supposed to take it at face value, it’s boring; if we’re meant to laugh at it, it’s repellent. The second episode is somehow worse. Stranding Michael Cera in a character utterly devoid of charm or humor, the actor plays an irritating loser who annoys everyone with his overbearing personality, until he stumbles his way into a CrossFit-esque gym, where he fixates on his trainer (Rosario Dawson) and tries to take over what he sees as a chance for a new family. There are no jokes, just an actively unpleasant Cera camping it up on his way through a story that turns into a surreal body-horror tale, albeit one done in the style of a Mad TV bit with even fewer chuckles. Neither comedic nor dramatic, it’s a painfully inert slog. The final episode of the series works best, in part because it’s the most overt sketch-comedy premise installment, but more so because it’s only 17 minutes long. Awkwafina and Yvette Nicole Brown star as a pair of criminals who slowly realize they’re stuck in a TV show, giving the comic actors plenty of latitude to mock the conventions of both bad TV writing and prestige cable dramatics as they frantically search for a way to escape before the conclusion of the series finale blinks them out of existence. (After Awkwafina expresses relief that they’re on a cable drama, Brown asks, “How is that good?” “Oh, just artistically,” Awkwafina replies. “It doesn’t help our situation.”) It makes hay of every reference from the series, including fake ad breaks for commercials set within the world of Weird City, and the antic pace and good-natured meta humor give it an Adult Swim vibe that makes you wonder why the whole series didn’t try for such simple and engaging nonsense. Weird City is a confusing jumble of tones and ideas, and it never coheres enough to make the storytelling work. Bringing in experienced directors like Adam Bernstein, Amy Heckerling, and Tricia Brock only highlights just how little there is to do within this framework, which is the opposite of what an open-world anthology series should feel like. It really does seem as though Peele co-created it because he missed the opportunity to be goofy—unfortunately, this scattershot assortment of undercooked ideas does a disservice to both the satire and the silly.